A plunge pool is a great option for people who want the benefits of a pool without the upkeep and expense of installing a larger pool in their yard. Plunge pools are incredibly popular around the world for their health-bringing benefits, lounging opportunities, and exercise-friendly nature. 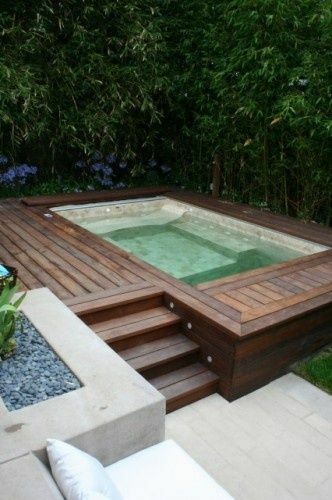 Plunge pools make an incredibly versatile addition to your backyard. If you are looking for a small pool option to round out your outdoor space, consider installing a plunge pool. These kinds of pools are often small and shallow, and have been traditionally used to cool down after a trip to the sauna or a good workout. 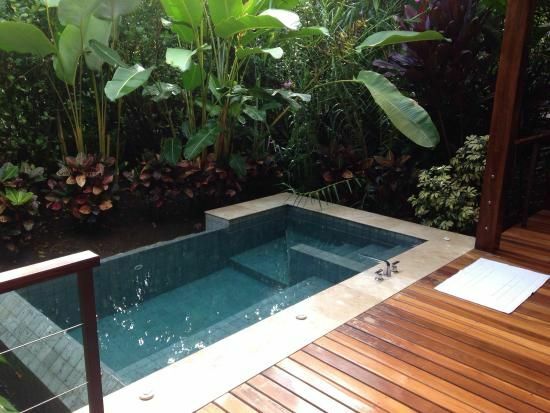 These pools are usually unheated for this very reason, but they can be heated if you are looking for more of a smaller pool feel than a plunge pool. If you have an outdoor sauna, a small pool can be the perfect addition for those times when you need to cool down. If you already have a hot tub on your deck or patio, a pool could be integrated into your space and connect with this other small body of water. With the right design and planning, your backyard could become a relaxing oasis. On hot summer days and warm evenings, a plunge pool can provide a cool place to hang out and entertain friends and family. When integrated with seating, your pool can become the center of activity all year round. 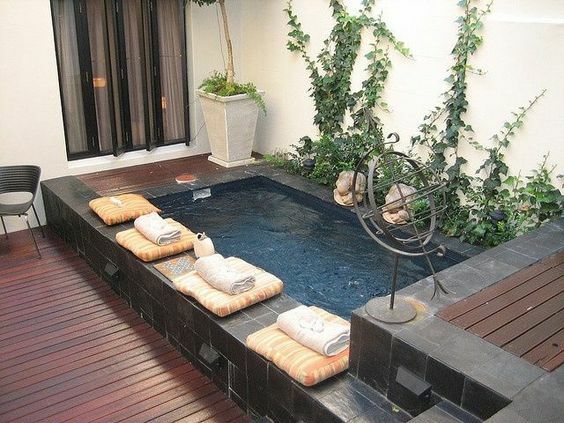 However, when considering installing a small pool like this, you have to keep in mind the limitations of a plunge pool. 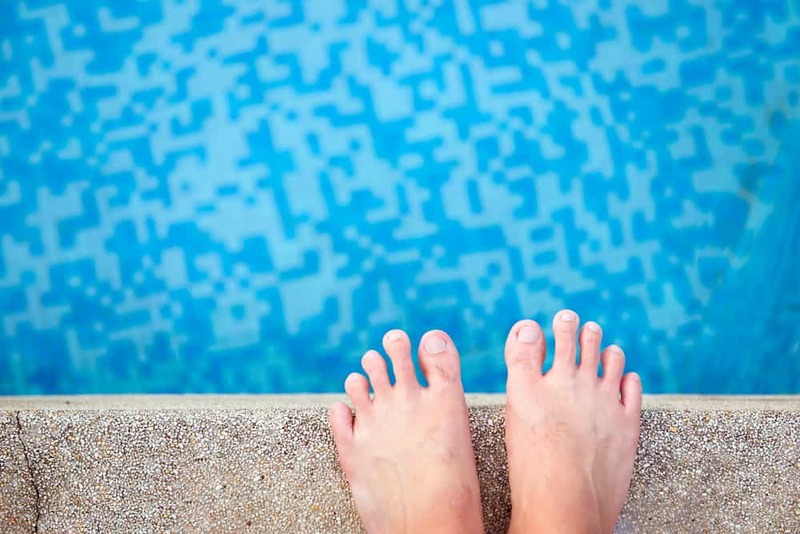 If you want a space to swim laps, play pool games with your family, or a deeper body of water to dive in, a plunge pool may not be right for you. These pools are great for people who want a space to soak, relax, lounge, or just hang out by the water. If you are working with less outdoor space, small pools are beneficial for your landscaping options and can still leave lots of room for backyard landscaping. There are many different pool designs you can use to create a beautiful backyard space around your pool. One common design is natural landscaping, which can create a barrier around your pool while giving you a green, colorful environment to swim in. Natural landscaping can mean you put shady trees around your pool, or small shrubs that allow lots of natural light in. You can also consider putting raised planters or flowerbeds around your pool for a flash of color throughout the year. Other good pool plants include ferns, mosses, succulents, and plants that thrive in wet environments. 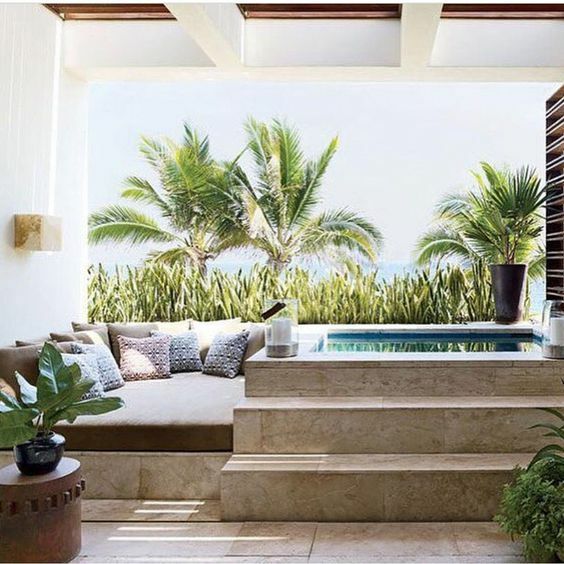 Plunge pools are usually connected to a sauna or hot tub, but you can also add ambiance with another water feature. Fountains or waterfalls can provide a relaxing pool atmosphere and allow you to really enjoy spending time outside near or in your pool. Finally, your pool can take on different designs based on how big your yard is and where you want the pool in proximity to your house. 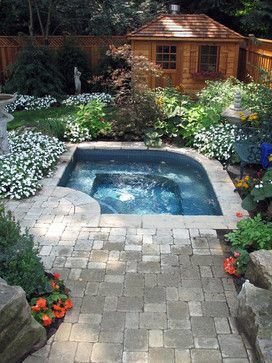 Small pools can be placed in a variety of areas, making it easy for you to choose a good spot for it to go. You can also decide if you want a square pool, a round pool, or a more customized design. 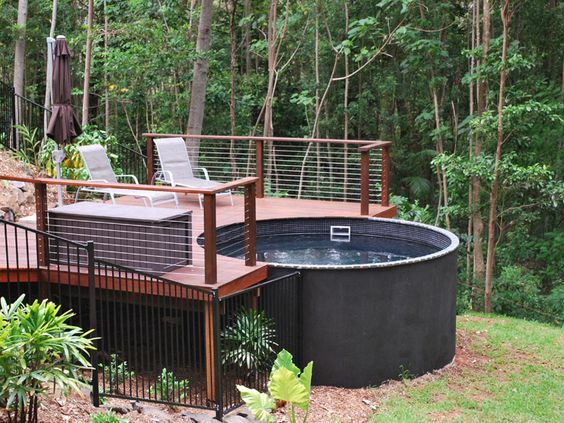 A raised plunge pool could be installed near an existing hot tub or spa. Small pools can be great for young kids. A pool can blend in with your existing patio space. Natural landscaping can create an outdoor escape. 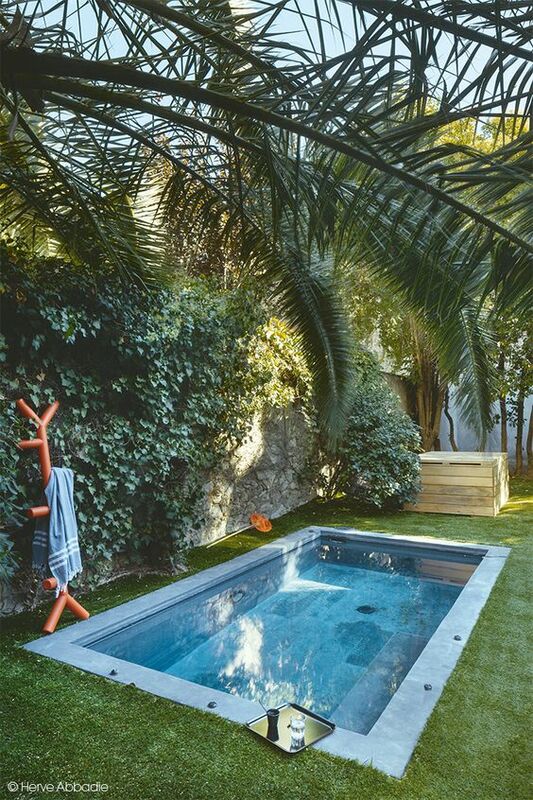 A plunge pool can integrate seating inside and out. A plunge pool can be kept private. 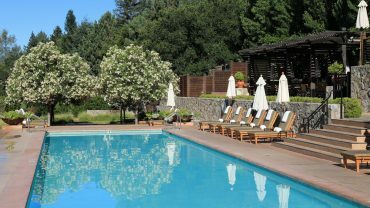 Wood can provide a stable and strong surface for a pool. Create a spa in your own backyard. 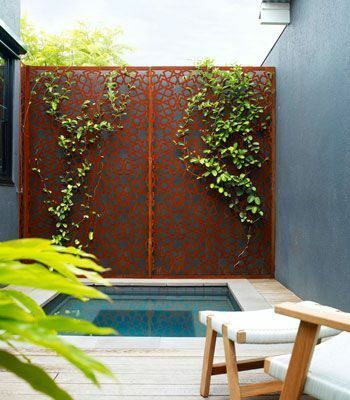 Integrate your outdoor patio with a plunge pool. Any backyard can fit a plunge pool.